By all four assembly manuals for about the price of 3! 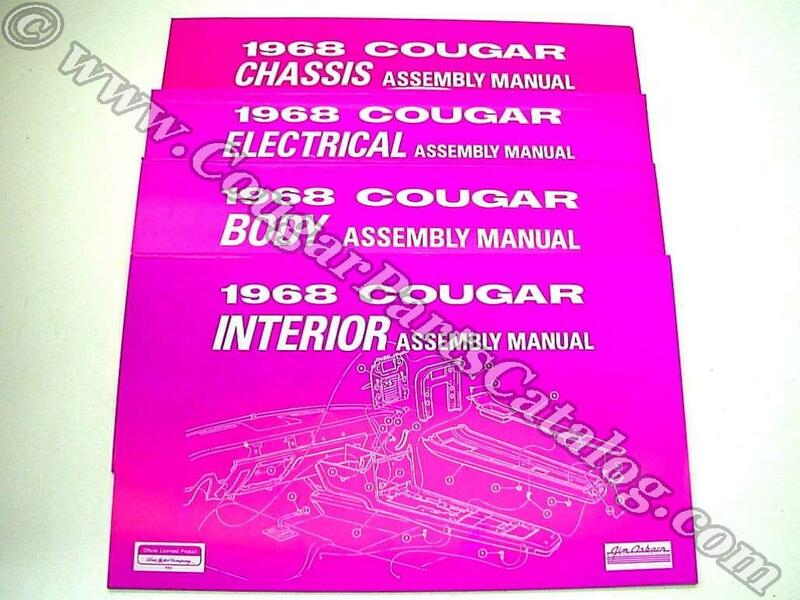 Get the Body, Interior, Electrical, and Chassis Assembly Manuals as a set and save big. These are a must have for anyone doing their own repairs. Even if you pay others to do your repairs you should always have these in hand when you hand the keys to your mechanic as it will save whoever does the work hours. These are the blueprints the line workers used to build these cars in the day. Every nut bolt and clip is shown. The exploded diagrams make it easy to know what goes where. You need to look at these diagrams BEFORE you tear into your car so as not to damage expensive, hard to remove, delicate parts. A truly "Must Have" set that is more valuable than even the shop manuals we offer. This was one of the first things I purchased when I got my 68 Cougar. It breaks down every last detail beautifully and has helped me numerous times with finding problems. A definite must have for anyone that likes to get there hands dirty in the garage. I struggled with the cost of these at first not knowing if I would actually need these but Im glad I made the choice to invest in them! I Already I have used them to reference how something gets mounted back on the car or which direction something should go. I agree some of the text can be hard to make out but remember these are copies of originals. Also the watermark could be lighter as its distracting in some cases. Overall its a great resource to have when working on your car! A must have if you're working on a 68 cougar, great for getting the small details just right. As someone else mentioned the watermark is a bit dark but overall these are a treasure trove of knowledge. I really needed the electrical manual to sort out the dash wiring on my car after a previous owner meddled with it. I made the call to buy the whole set because I knew I would end up buying the others down the road. Could not be happier with my purchase. There is a wealth of information in these books and since they are not original I do not feel guilty keeping these in the shop and smudging them up with greasy fingers.